Medical alert bracelet disguised as a normal looking sport watch. No one has to know you’re wearing a medical alert bracelet unless they press the ALERT button. | Looking for Silver Version? What is a Digital ALERT Bracelet? No Fees. 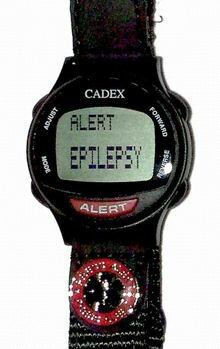 If you’re looking for a discreet medical alert bracelet, the CADEX Medical ALERT Bracelet is the right choice for you. No computer needed: Input critical personal medical information and setup to 12 daily alarms without the use of a computer. One unique factor that differentiates the CADEX Medical ALERT Bracelet from all other medical ID bracelets is that it can also remind you when to take your medications up to 12 times per day with text message; ASPIRIN, COUMADIN, EAT SNACK etc (up to 36 letters per alarm). What is the advantage of a CADEX Medical ALERT Bracelet? Eliminates the need for engraving. Update without any delay.